Have you found an online vendor selling Deadhead Aged? DeadHead Aged Rum is produced in Veracruze, Mexico from molasses and then double-distilled in a Pot Still. The rum is then charcoal filtered and lastly aged for six years in Sherry casks. Okay, it has a creepiness factor of 10 which makes it stand out from all other rums out there in regards to containers. However can it stand apart from other rums in regards to flavor? First off the color is a light amber...closer to a yellow color in some apple juices. It has a slight sugar cane aroma with fair amount of astringency reminding me of ethanol. The flavor isn't too bad. Not great but it hits you with some sweetness and vanilla/toffee tones which then fades into a rather decent burn. Being that it's a blend of sugar cane juice and molasses it does have a bit of an agricole edge to it. The aging gives it a bit of oak bitterness bordering on objectionable but not quite. It ALMOST is a sipping rum but misses just by a tad. However it does very well as a mixer. Not a bad rum. However it really doesn't stand out from other similarly aged rums. Therefore I can't go higher than a 7 here. Forget the bottle. This is a fine rum. Aromatic. Complex. Singular. Notes of spice, grass, and funk. Makes a mighty fine cocktail, probably is amazing with cola, and is a unique sipper. A little pricey, but try it if you get a chance. This seems more like a souvanere product, than a serious rum. I find the taste leaning towards tequila rather then good rum. Not for me. Great tasting rum. I had to have it for the bottle, it tastes pretty great too. Den här är lagom söt. Lite kick mot slutet. En god rom i övre skicktet. My first mexican rum. Didn't have high expectations on this one. But it was ok. Nose: alcohol and vanilla. Palate: not to sweet with flavours of exotic fruits and rasins. Deadhead is completly missing any flavour, leaving you with taste and smell of ordinary alcohol. Good thing is, that it is still surprisingly drinkable, but there is no joy in it.Unique bottle could be saviour, but it looks better on picture. Cheap plastic material is yet another reason to be dissapointed. Duft af fad og lidt chokolade? Ikke sprittet, og lidt slag af karamel. Altså det man kan nå at smage inden alt forsvinder igen. Sidder tilbage med en lidt flad fornemmelse. Den smager ikke grimt. Den er bare intetsigende. Didn't really get me excited - harsh, probably good as a mixer. I must admit it was probably the packaging that caught my eye! 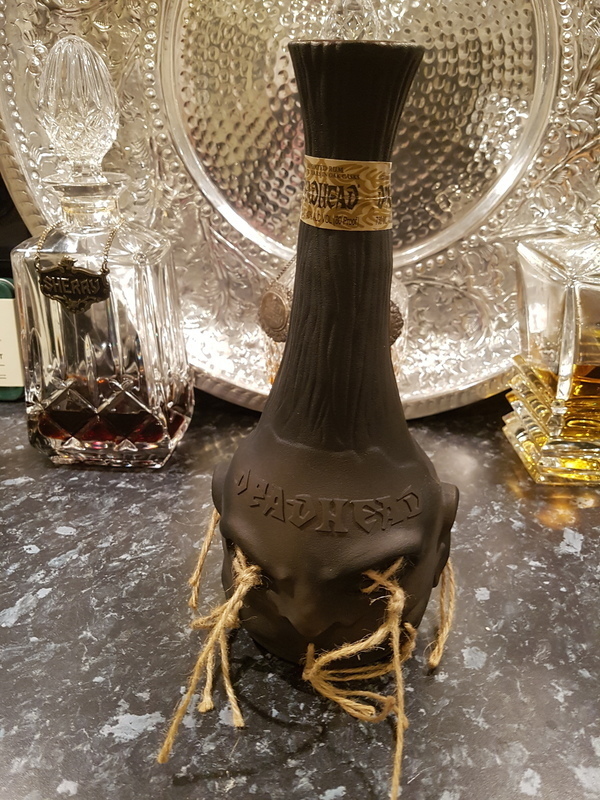 Nice marketing with the bottle but the rum it self is quite hot. Not a rum I would recommend except for the souvenir bottle. The bottle would make a nice candle stick holder. Don't recommend it at all. It's a strange combination of aromas. nimic intersant, destul de fin dar fără pretenții.. The bottle is the obvious selling point; unfortunately, one cannot eat or drink the plastic. The rum itself is of darker mahogany brown color, a standard hue conjured by a liberal dose of caramel. The nose is weak, with hints of caramel, and cocoa. The taste begins with a weak sweet note (maybe some added sugar, but definitely not much), and develops into cocoa, dark chocolate, tobacco, the mouth-feel is slightly oily with a spicy, salty tones evoking aged salami, and perhaps soap. The finish is short to non-existent, bitter tannin with more cocoa. Overall, a very thin and muted rum. I really thought the best thing about this rum would be the bottle...but it is really a good rum...you can even si it although a mixer is its true place for me. Worst rum I have ever had the misfortune to try. No depth, no character, no noticeable flavours and no redeeming features. Tastes artificial, more like a failed chemical experiment than a rum. Mexican folks can make some amazing tequila's, but I haven't been able to find even one decent dark rum. Deadhead 6 year old rum has very nice deep dark rum color, smell is pure wood and the taste test is cellar dampness weird sherry cask infusion. Hardly any burn on the only positive side. Theres not much happening.... I could only smell and taste added caramel. I mean it tastes ok and makes a decent mixer but take the bottle away and your left with a very average rum. Once finished wont be repeated im afraid.